Both Tim Smith and I made the trek to Salon Son et Image this year; in Tim’s case a 2-hour train ride, in my case a 600-km drive (Tim’s show reports for this year can be read on 6moons.com). The show remains at Hotel Bonaventure, but is now run by The Chester Group. Exhibits were down compared to last year, about 55 rooms vs the 70 of a year ago. As usual, Sony Canada had an enormous presence – they were literally everywhere. Naim Audio had several setups. But I didn’t see perennial show stalwarts like Krell, Wilson, Mark Levinson, or Martin-Logan represented, or even Audio Research or Conrad-Johnson. Verity and Blue Circle were absent. Totem and Triode Lab had largely static displays. Even Lenbrook’s power stable were MIA – no NAD or PSB; heck, I saw no Paradigm, Axiom or Polk either. No Energy, no Klipsch. Have all these folks given up on audiophiles and realized that their money is in the box store mass market? I don’t know. The economic tides have reversed in the last year or two – Canada’s currency is weak and of course, our oil economy is down with the global market/supply issues. Montreal’s show has long been Canada’s best 2-channel audio show, but being only 3 weeks apart from AXPONA (Chicago), well, it seems many suppliers are making strategic choices. To borrow a lousy cliche, times aren’t what they used to be. That said, it was a busy show, with decent attendance, and a number of excellent rooms. WoS congratulates all the exhibitors for their effort in putting on this three-day extravaganza. Anyone who’s been involved in something like this knows how intense and exhausting it is. Starting with the best. No, I mean the very best. That I’ve ever heard. Anyone who knows me, knows that I care very little about megabuck audio, and hearing a half-million dollar rig holds little appeal. I just avoid them. 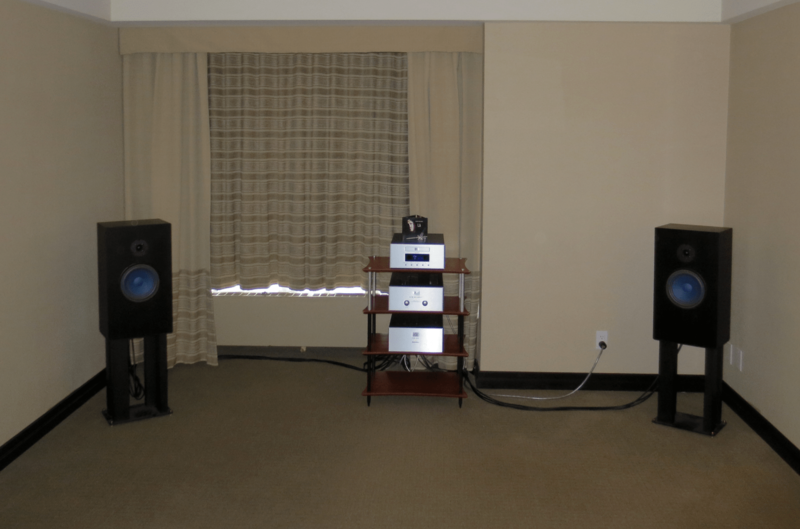 But the room put on by Tenor Audio, Muraudio and Kronos Audio – was likely the finest stereo system I’ve experienced. Billed by SSI as “the world’s best all-Canadian audio system”, this was a big system, in a big, beautiful room, set up nicely, decorated beautifully….it was done just right. And I don’t think I’ve ever in my life heard musicians playing in front of me more realistically, outside of a concert hall. This was more than a believable illusion, this was a feeling of being there that surpassed all previous. I can’t believe I almost missed this room. Thankfully Tim took me there. Thank you Tim! I won’t soon forget it, especially when the exhibitors spun Vivaldi’s Rustic Concerto from the famous “The Tube” LP by Tacet Records. What an experience! I was nearly in tears at that point. I won’t recite the technical details…Google is your friend. But even if discussing it is pointless, I will say that hearing this rig was very worthwhile, and a great privilege. Congratulations to everyone who put this system together: Best Sound of the 2015 Show is deservedly yours, in my humble opinion. Soltanus Acoustics. It’s not every year that a new full-range electrostatic makes its’ debut. This was something of an event, at least for SSI showgoers. And indeed there was a lot of action and genuine excitement in the Brooklyn Audio room, which featured the new ESL Virtuoso from Serbia’s Soltanus Acoustics. Inventor/designer Zoltan Mikovity was on had all weekend answering questions and overseeing the demos. The Virtuosos were being driven by the legendary Threshold 400A, a Class A Nelson Pass designed amp from 1978. With a superb analog front end, it made for a magical combination indeed – fluid and effortless with acoustic music, right up to full orchestral works. A big, gorgeous, unstressed, immersive sonic experience. And better than any pure electrostatic that I’ve heard previously. With 1970’s rock and other overproduced music, it didn’t fare as well – and that only contributed to my feeling that this is a very worthy transducer. $11,000 Canadian is the retail price for the Soltanus. If you’re in the market and even if that sounds like a lot, find a way to hear these speakers. I really doubt they’ll be priced this low in a year or two. Best New Speakers of the 2015 Show goes to Soltanus Acoustics and their importer, Brooklyn Audio. Audio Note UK‘s room was very, very good. The musical selections were great (and appropriate), and if I needed one word to describe the sound, that would be it: musical. Very engaging, great pace and rythym. Folks, this is what 2-channel home audio is all about. Anyone who still doubts that simple, well-executed tube electronics are at the top of the audio heap should spend some time listening to this kind of system. Nicely done. Bombastic music is fatiguing for showgoers (not to mention the exhibitors), and unless a room is really “dialed in”, it makes more sense to use music that highlights midrange purity, tonal richness, phase coherence, and so on. The fundamentals. There was nothing spectacular about this room, nor the way the gear looked. Modest and compact. And again, I could have listened all day. Best Digital Sound of the 2015 Show goes to the AN folks. Well done! Tri-Art Audio, hewers of bamboo (and electronic geniuses) from Kingston, Ontario. What a fabulous setup. This outfit makes everything – the open baffle speakers, Class D amps, preamp, turntable, tonearm….and my God, it works. Now, the look is somewhat polarizing. But I heard no negative comments in this room, and it was abuzz with people every time I went in. Great music was always playing, and sounding great. The turntable and tonearms, in particular, were a sight to behold. Something handmade of this caliber should cost far more than what they are asking. The same is true for the other products. 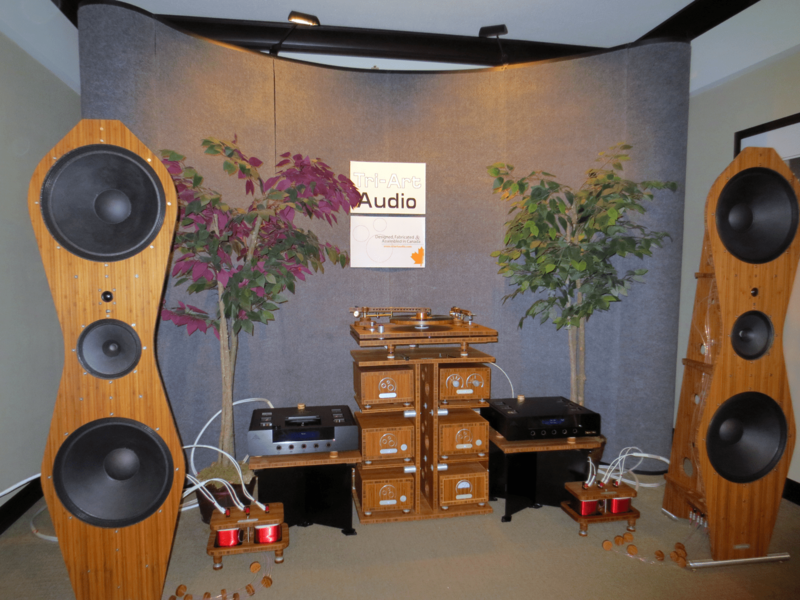 The large OB speakers shared some design similarities with the PureAudioProject OB’s. They sounded livelier, maybe a bit less tamed, than the Tangband-based PAP. They were also out too far into the room, due to a tall window-blocking display behind them, which didn’t quite fit the way it was intended to. The potential in this system seemed limitless, especially considering the room constraints. And both Tim and I wandered away scratching our heads and muttering about the pricing…how do they do that? Labours of love, no doubt. This is a very special family business. The award for Insanely Great Value in 2015 is warmly given to Tri-Art Audio. 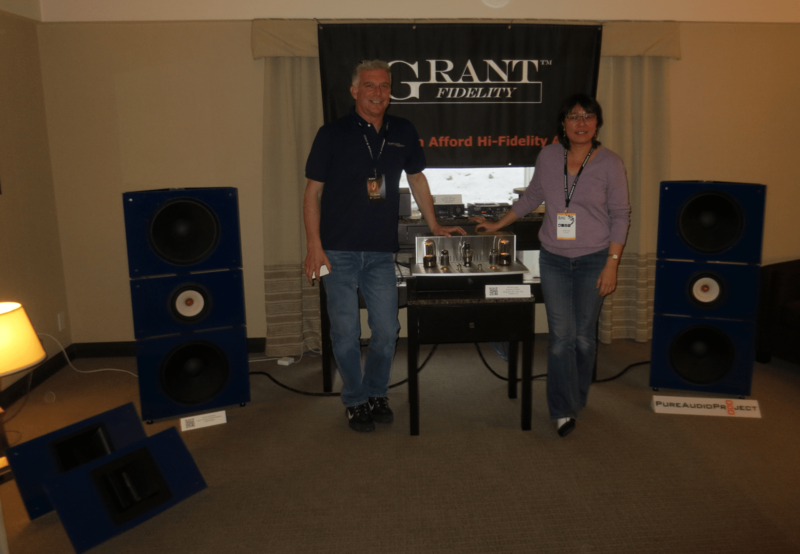 Grant Fidelity was again partnered with PureAudioProject, and their room revolved around the PAP open baffle kits, appearing this time in brand-new livery – blue acrylic! I took a few minutes to acclimatize to it, but came to really like the new look. It certainly addresses the domestic concern around “big ugly speakers” – these versions, in your choice of colour, should integrate well aesthetically, rather than dominate. 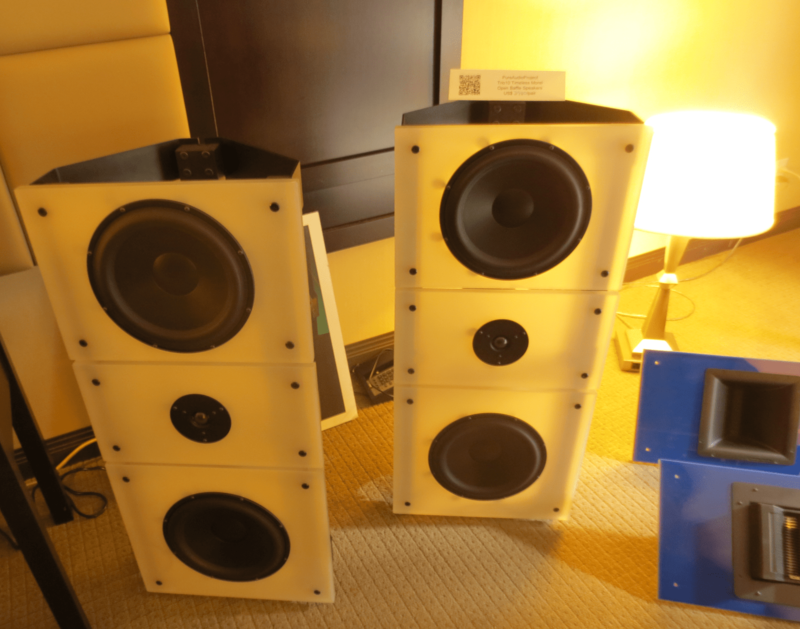 Also on display (in white acrylic) were a smaller pair of Trio10 kit OB’s, which looked like “kid brother versions” and are based around a pair of 10″ woofers instead of the 15″ Eminence-based Trio15. These come in at the same price level since they use more costly drivers made for PAP by Morel. Designer Ze’ev Schlik told me that the 10’s are intended for smaller living spaces. 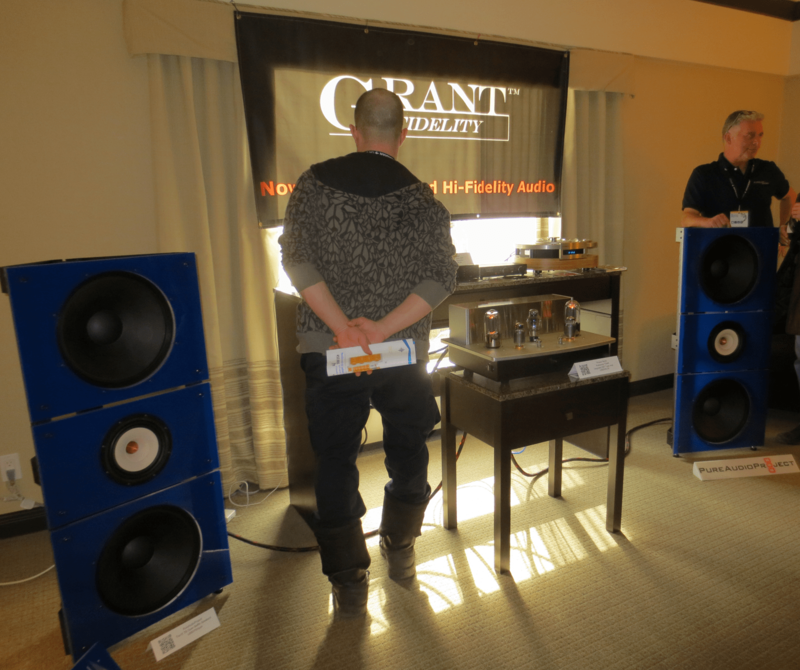 These were on static display, and the Trio15’s were singing, and to my ears were sounding even better than they did at the TAVES Toronto show. They were driven this time by a Psvane 845 stereo SET amp worth $3500. Rachel Grant kindly arranged for an upcoming review of the Trio15 by our man in Alberta, Mark Morris. She was quite emphatic that these speakers like some amps more than others, and highly recommends the ~22wpc 845-based SET approach. But the big news at this show was laying on the floor – two different driver modules (both very different from the Tang-band W8), each bolted onto the same blue acrylic mid-panel. Yes, the Trio15 now boasts a full-range driver modular swap system! Brilliant. Perhaps this was in Ze’ev’s mind all along, but I didn’t see it coming. The beauty of this entire design is really starting to show now. Unfortunately, in getting to Montreal, Ze’ev had to deal with US Customs, and they handled his brand-new crossover modules roughly enough to render them useless. Without their crossovers, the optional modules couldn’t be demoed. Something to look forward to! Once again, Rachel and Ze’ev had a superb sounding room, with a lot of activity and genuine excitement. They’re also among the friendliest and most approachable exhibitors. For the Duet and Trio models’ new role as fully customizable “building blocks”, I want to award the PAP speakers Most Promising Audio Development of the 2015 Show. And I myself am very much looking forward to MM’s review for Wall of Sound. 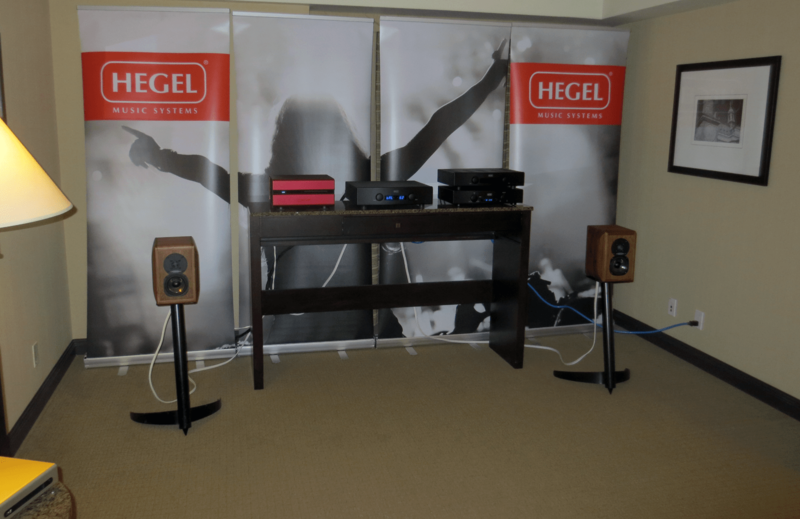 Finally, the Vmax Services room featuring Hegel electronics, was consistently a sonic winner. 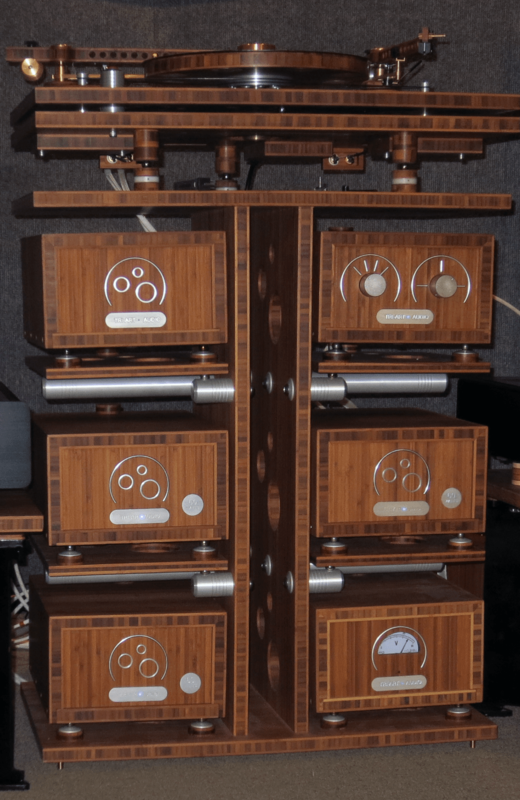 When coupled to the solid-wood Diapason Karis monitors, this room provided quite a musical shock factor. Richard Kohlruss was demoing the system with a Triangle France sampler CD, and the sound coming from these tiny speakers was just astounding. Every time I wandered into this room, there was a great sense of musical flow and purpose. I want to acknowledge the Vmax room for Consistently Excellent Sound in 2015. There were many other excellent rooms, but at some point I have to cut it off, and call (the above) my favourites. Other rooms achieved good, even great results, but the ones already mentioned really over-achieved. Or in the case of the Tenor room, they at least met all of my very high expectations. 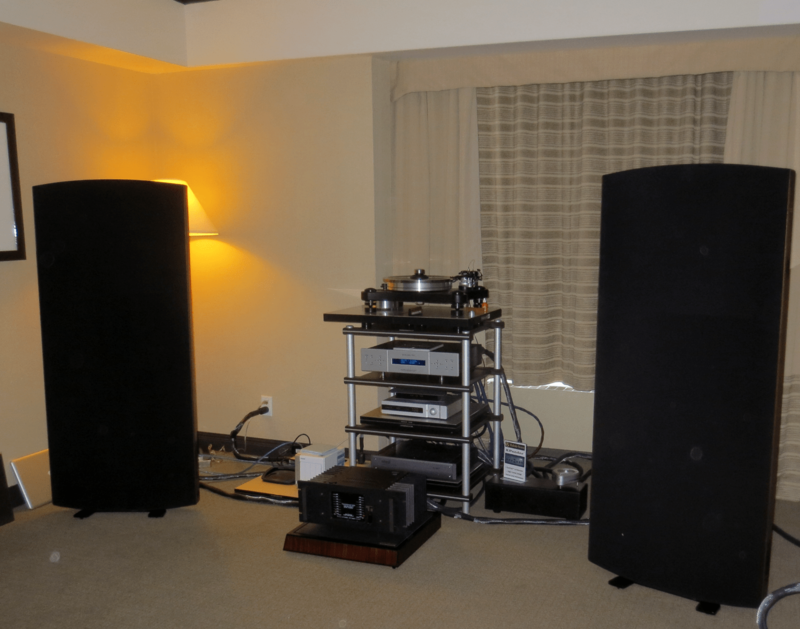 Honourable mentions: the Harbeth room, feauturing Rega electronics was making fine music – I was able to listen for quite a while on Friday, but the following day it was just a mob scene. Both days only the small monitors were in play (why?). The room with Dared electronics and Rogers speakers was very nice as well. 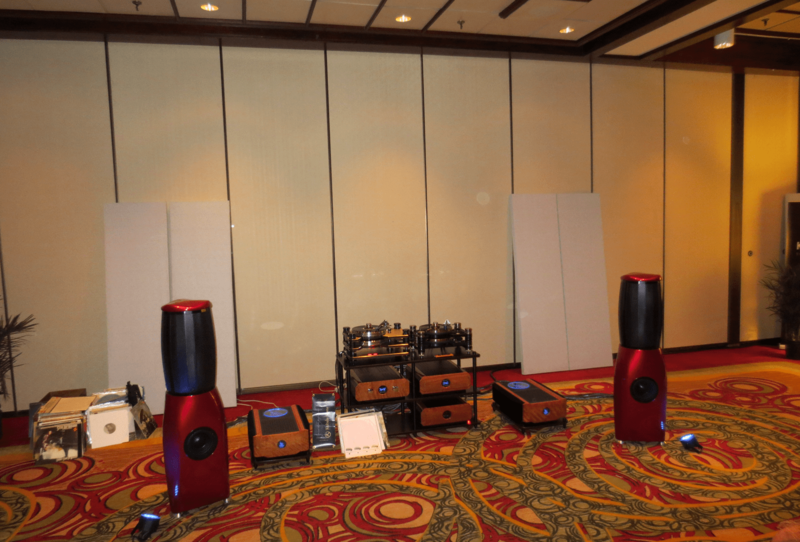 Import Hifi’s large area was divided off into three demo rooms, featuring spealers from Davis Acoustics and electronics by BC Acoustique, and was making very good sound. Lastly, I heard a lot of potential coming from Dali’s speakers, which I think were inadequately matched to electronics perhaps more suited to home theater sound. If there was a theme in 2015, for me it was analog. Nearly all of the best rooms had excellent turntable setups. Proportionally, the Toronto show had fewer working setups. But at SSI too, there were far too many static displays of mouth-watering vinyl rigs.